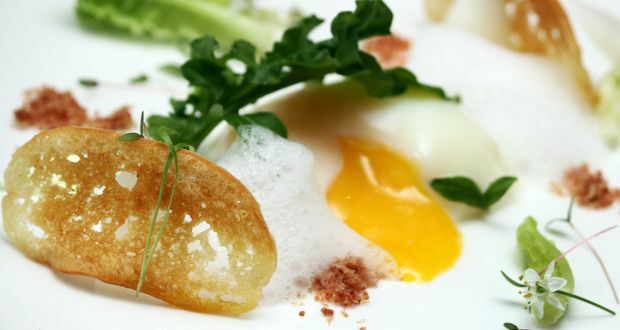 The dish has crispy bacon with eggs poached perfectly to your desire and creamy Parmesan foam. 2.Place a spoon on the bottom of a pot and fill the pot with water, bring the water to 62 degrees Celsius. 3.Place the egg on the spoon and poach it for 30 minutes. 4.Use a temperature gauge to ensure the water does not go over or under temperature. 5.If the temperature starts getting to high drop an ice cube into the water to bring it back down to 60 degrees Celsius. 6.Drop the egg into ice cold water to cool down quickly. 7.Crack the egg into a small dish carefully and soak the excess water with a paper towel. 8.Place the egg into the middle of the dish and arrange the Romaine Hearts, Bacon, Toasted Baguette and micro greens around plate. 9.Garnish with parmesan foam you have made last minute. 1.Gently bring the parmesan, ¼ Anchovy Fillet and water to 80°C and allow too steep for at least 30 mins. 2.Remove and strain the steeped liquid and add the soy lecithin to liquid. 3.Season with salt and pepper to taste, but be aware that cheese and anchovy fillet is already quite salty. 4.Whisk with stick blender and harvest the air that forms on the surface. 5.Repeat this process as more air will continue to form. 6.Use this to garnish the plate, when presenting to guests, nick the egg yolk with tip of very sharp knife, as too let the yolk start oozing out. 7.This is a great dish to impress your friends for a Sunday brunch as a starter and even better served with a Peach Bellini.